Wednesday December 17th 1884. Weather intensely cold. We had the washing done and are frying out lard from a hog we had killed yesterday. Wrote to Will. Thursday December 18th 1884. Weather very cold indeed. We finished the lard and got some of the ironing done. I am doing some knitting Wrote to Vene. It was three months today since Rob was buried. Friday December 19th 1884. I was in town most all day though it was very cold. We girls are busy with our arrangements for the christmas tree. I got some presents and came home to supper. Saturday December 20th 1884. It was a snowy day. I was at home at work all day. 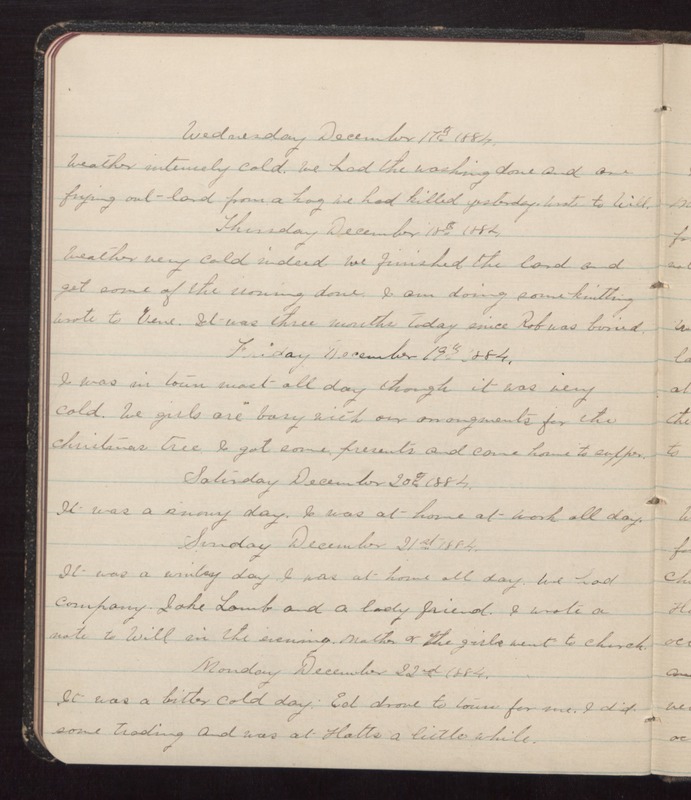 Sunday December 21st 1884. It was a wintry day. I was at home all day. We had company. Jake Lamb and a lady friend. I wrote a note to Will in the evening. Mother & the girls went to church. Monday December 22nd 1884. It was a bitter cold day. Ed drove to town for me. I did some trading and was at Hatts a little while.